We love to go to the drive-in movie theater near our home, but honestly….I just can't stay up for 2 or 3 movies that last into the wee hours of the night…plus it gets really expensive with 6 in our family! So sometimes instead of going out to the drive-in movie theater we just make our own DIY Drive-In Movie Night at Home! It is just as fun and actually a whole lot easier than loading up and driving into town! We are not far from the bathroom which is a big bonus with a toddler in the house. We know that if we forget anything…it is just right inside! Plus…it saves a LOT of money! This is also a great option for families who don't live near a drive-in theater. I know that drive-in theaters are not as common as they used to be. 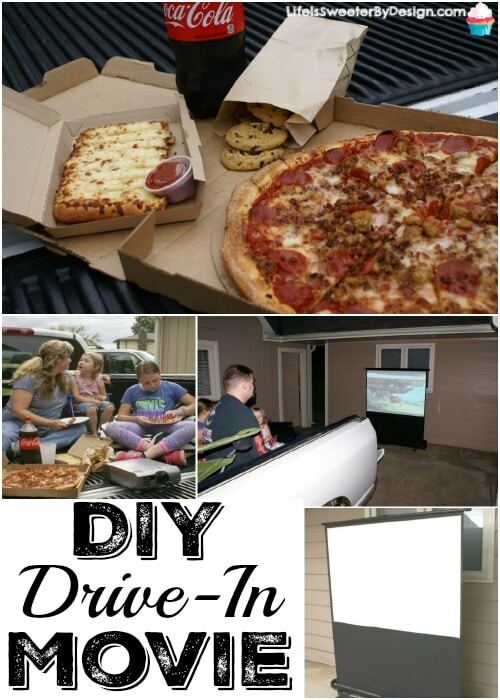 So you can just create your own DIY Drive-In Movie Night at Home and it will be a hit with the kids for sure! There are a couple of ways you can do this. First off you can use an actual projector screen that is attached to a stand. This is what we are using because we already have a screen that we have had for years. There are some really fun portable screens available now for outdoor events at reasonable prices. If you don't have a projector screen….no worries. 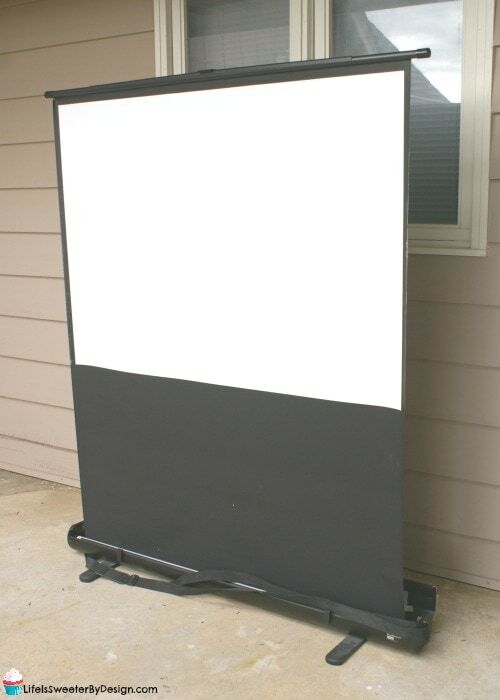 You can just take a white or light-colored flat sheet and hang it up over your garage door or on the side of your house….wherever you plan to set your drive-in up! The part of the drive-in experience that is so fun is watching the movie in the back of your truck or van. If you don't have a big enough vehicle to use for this fun time…you can always just pull up some lawn chairs in front of the screen! I am not sure why….but my kids LOVE to sit in the back of the truck and watch movies!! 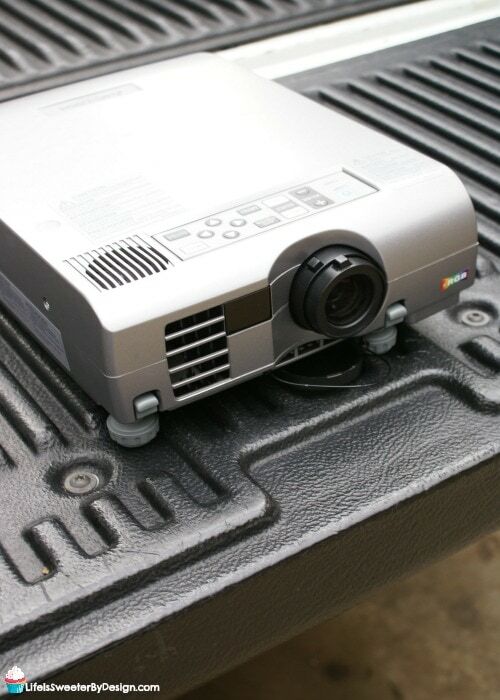 You may want to sit your projector on a small box or something to make it the right height for your screen. We always have lots of blankets and pillows and lawn chairs in the back of our truck when it comes to drive-in movie night. We want to be comfy and cozy and just ease into the movie in comfort! A must have for your DIY Drive-In Movie Night at Home is FOOD! 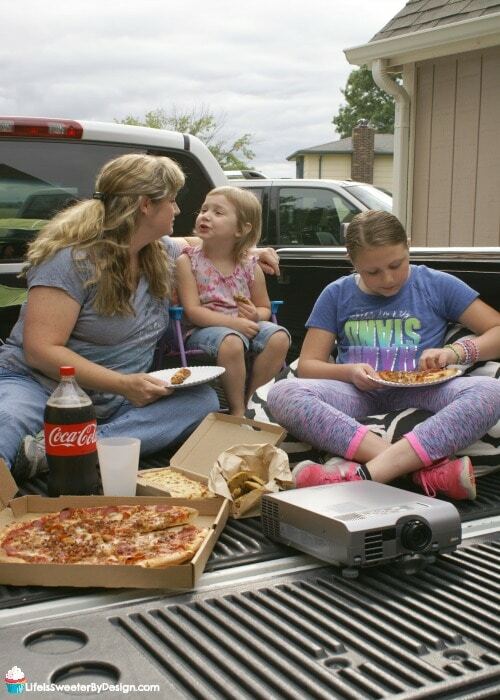 Part of the fun of a drive-in movie experience is that no one has to cook dinner….you eat outside and you want something easy to eat. I don't know if there is a better “finger” food than PIZZA! I decided to make our DIY Drive-In Movie Night at Home really easy on me and my wallet by swinging over to Sam's Club when I got off work. 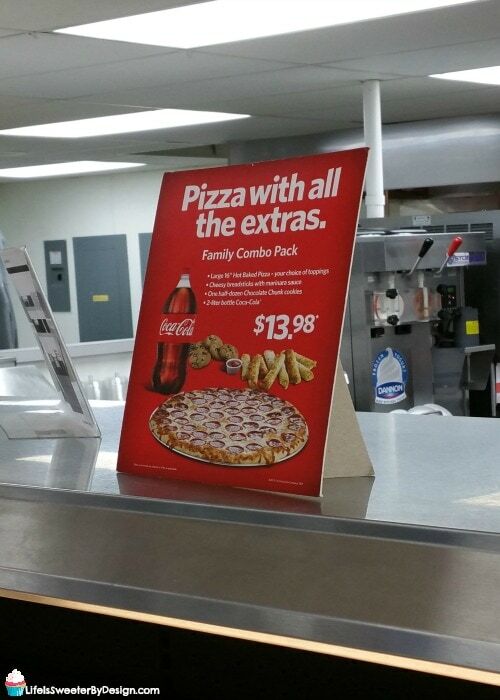 I grabbed the Family Pizza Combo which includes a hot 16 inch pizza, cheesy breadsticks, cookies and a 2L of Coca-Cola. That is a great deal for only $13.98!! What is easier than grabbing a ready to go meal from Sam's Club and heading home for some outdoor summer fun? Plus with a price that nice….the kids can even invite their friends over for our DIY Drive-In Movie Night! 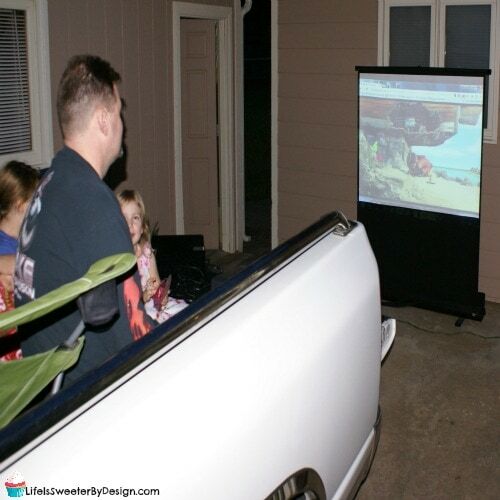 Have you ever had a DIY Drive-In Movie Night at your house? I would love to hear how you made your drive-in movie night special! What are your favorite movies to watch at your DIY drive-in movie night? 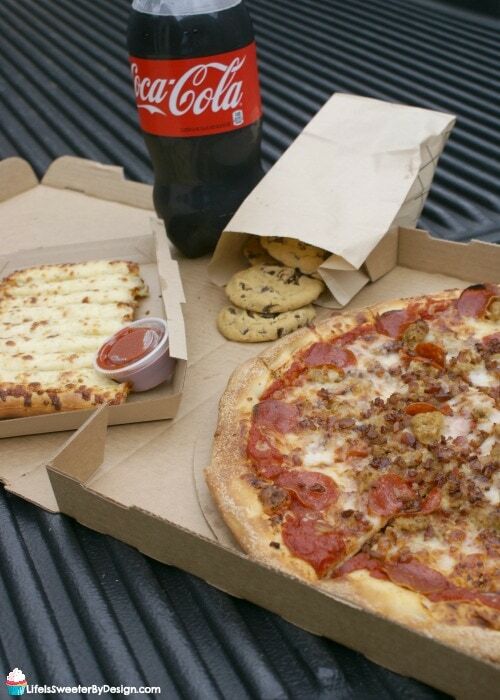 Be sure to pick up a Coca-Cola Family Pizza Combo from your local participating Sam's Club. You can find a club near you HERE. This is such a fun idea! I love being able to save money in the long run and having all the convenience and fun which is definitely what you’re doing here! I absolutley love this! What a great way to have a family night! This is a great way of saving money in the long run due to the fact the Cinema costs a bundle! Wonderful! That looks like it would be a lot of fun! I am SO glad we have summer again so that we can do stuff like this with the family. Goodness, the grand kids would love a drive in movie night at home. We don’t have any around here and it would be fun to show them what it was like. Of course pizza would be included. What a fun idea, and a great way to enjoy family time. The movies are probably the only place where people put away their phones, and having a drive-in experience at home can maybe help distract from technology. So very true…great way to spend time together without phones!! What a fun and awesome thing to do! I remember when we had drive-in theaters…they were a ton of fun! When we go as a group we really could not understand the movie because all we do is throw popcorn and have fun, or even talking! LOL! That is hilarious! Yes..there have been times we have been too loud to see the movie too! Pizza and a movie, that’s awesome! What more if it’s done in your garage or backyard, that will definitely make it more fun for the kids and the entire family. Love this idea, it’s perfect for summer! What a fun way to spend some time together. I really miss going to the drive-in sometimes! This is such a fun idea, and that pizza is making me hungry haha! We actually have a movie theater in our house – I know sounds kind of crazy, but it’s always been a dream of ours so we created one a few years back 🙂 It’s pretty neat! Wow…that sounds like so much fun! What a brilliant idea! This is very practical, especially if you have a big family. I will be borrowing your idea. Nice! I like this idea, this is perfect for our weekend family date. I think this will give us so much fun this weekend! That looks like so much fun. I would love to do this with my girls. I just need to get a projector so that we can do this. This is great for family time. What a great idea! I want to do this. I’m sure my family will have so much fun. Well, I don’t think this idea fails anyway, it’s great to see it as a recommendation and kind of a reminder that “hey, time to have some fun!”. The outside setting will be a breath of fresh air as well. What an awesome idea! I’ve always wanted to get a projector and have some summer movies with the kids, cant wait!